Satellite cells, a population of skeletal muscular stem cells, are generally recognized as the main and, possibly, the sole source of postnatal muscle regeneration. 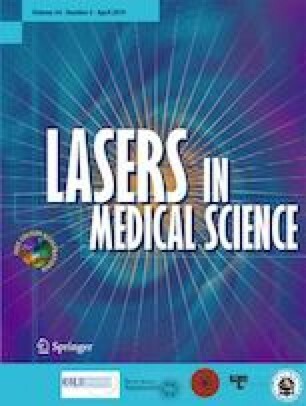 Previous studies have revealed the potential of low-level laser (LLL) irradiation in promoting satellite cell proliferation, which, thereby, boosts the recovery of skeletal muscle from atrophy. The purpose of this study is to investigate the beneficial effect of LLL on disuse-induced atrophy. The optimal irradiation condition of LLL (808 nm) enhancing the proliferation of Pax7+ve cells, isolated from tibialis anterior (TA) muscle, was examined and applied on TA muscle of disuse-induced atrophy model of the rats accordingly. Healthy rats were used as the control. On one hand, transiently, LLL was able to postpone the progression of atrophy for 1 week through a reduction of apoptosis in Pax7−veMyoD+ve (myocyte) population. Simultaneously, a significant enhancement was observed in Pax7+veMyoD+ve population; however, most of the increased cells underwent apoptosis since the second week, which suggested an impaired maturation of the population. On the other hand, in normal control rats with LLL irradiation, a significant increase in Pax7+veMyoD+ve cells and a significant decrease of apoptosis were observed. As a result, a strengthened muscle contraction was observed. Our data showed the capability of LLL in postponing the progression of disuse-induced atrophy for the first time. Furthermore, the result of normal rats with LLL irradiation showed the effectiveness of LLL to strengthen muscle contraction in healthy control. Yung-Ting Kou and Hui-Tien Liu contribute equally. The online version of this article ( https://doi.org/10.1007/s10103-019-02778-5) contains supplementary material, which is available to authorized users. We thank our colleague, Yu-Shan Lin, who has contributed to the concepts and experiments in this manuscript. This study was supported by the Grant-in-Aid for Scientific Research TMU100-AE1-B10, 101TMU-TMUH-11 from the Taipei Medical University, and the Taipei Medical University Hospital and Grant-in-Aid for Scientific Research 101-2314-B-038-017-MY3 from the Ministry of Science and Technology, R.O.C., Taiwan. The authors declare that they have no competing or financial interests. The authors also certify that they have no affiliations with or involvement in any organization or entity with any financial interest or non-financial interest in the subject matter or materials discussed in this manuscript.